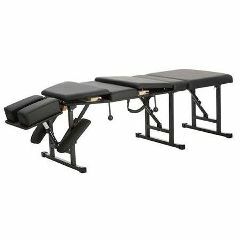 Folded Table Dimensions: 37" x 21" x 8"
Beautifully portable, the Basic Pro portable Chiropractic table is still tough enough to withstand the requirements of the most demanding use. It features both thoracic and pelvic drops, adjustable headpiece and a height range of 18.5" - 22.4". Imported.